Tripadvisor, the world’s largest travel site, has announced its list of the Top 25 Landmarks in the World for 2017. The results are based on ratings and reviews submitted by the website’s readers. Not surprisingly, the Taj Mahal features on the list (at #5). Three landmarks from India have also been included on Tripadvisor’s List of Top 25 Landmarks in Asia. These are the Taj Mahal, Amber Fort in Jaipur, and Swaminarayan Akshardham in Delhi. What’s surprising is that the Golden Temple in Amritsar doesn’t have a place on the list this year. It has featured prominently in previous years. Tripadvisor has compiled a list of the Top 10 Landmarks in India for 2017 as well. As to be expected, it has many iconic monuments and temples. Humayun’s Tomb in Delhi has reappeared on the list this year, after being dropped from it last year. The Gateway of India in Mumbai is also a new entrant. Siddhivinayak Temple in Mumbai and Gurudwara Bangla Sahib in Delhi are no longer on the list this year. Here are the 10 landmarks that made it onto the list. Taj Mahal, Agra: – India’s most recognized monument and one of the Seven Wonders of the World, the Taj Mahal looms fairytale-like from the banks of the Yamuna River and tops the itineraries of visitors to India. It’s popularly visited on a day trip from Delhi or as part of the renowned Golden Triangle tourist circuit. 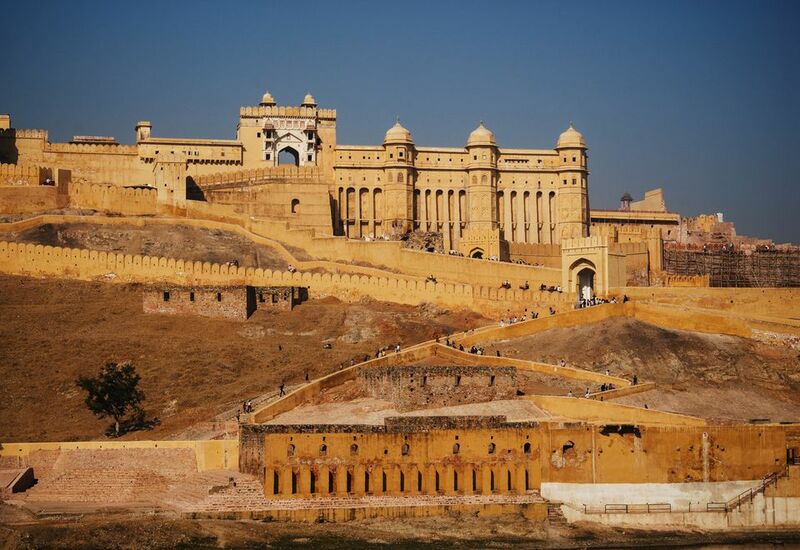 Amber Fort and Palace, Jaipur: – Located on the outskirts of the “Pink City” of Jaipur, Amber Fort and Palace was the original home of Rajput royalty until Jaipur city was constructed. It’s one of Jaipur’s top attractions and contains a number of breathtaking palaces, halls, gardens, and temples. Inside, the elaborate mirror work adds to the grandeur. Swaminarayan Akshardham, Delhi: – A relatively new Hindu temple complex, opened in 2005, the sprawling Swaminarayan Akshardham sits on the banks of the Yamuna River in east Delhi. It’s one of Delhi’s top attractions, and the world’s largest comprehensive Hindu temple. The temple is dedicated to Swaminarayan, founder of a modern sect of Hinduism known as Swaminarayan Hinduism (a form of Vaishnavism). It has a multitude of exhibitions and gardens that showcase India’s culture, arts, architecture, and history. Bandra-Worli Sea Link, Mumbai: – This cable-stayed bridge (one that consists of one or more columns, with cables supporting the bridge deck) crosses the Arabian Sea, linking the Mumbai suburbs with south Mumbai. It apparently contains steel wire equivalent to the circumference of the earth. The bridge also weighs the same as 50,000 African elephants, and used 90,000 tonnes of cement — enough to make five 10 storied buildings. It’s considered to be an engineering marvel. Qutab Minar, Delhi: – One of India’s most popular historical monuments, Qutab Minar is the tallest brick minaret in the world and an incredible example of early Indo–Islamic architecture. It was built in 1206, but the reason remains a mystery. Some believe that it was made to signify victory and the beginning of Muslim rule in India, while others say it was used to call the faithful to prayer. The tower has five distinct stories, and is covered with intricate carvings and verses from the holy Quran. Agra Fort, Agra: – Agra Fort, while undoubtedly overshadowed by the Taj Mahal, is one of the finest Mughal forts in India. It was originally a brick fort that was held by a clan of Rajputs. However, it was subsequently captured by the Mughals and rebuilt by Emperor Akbar, who decided to shift his capital there in 1558. There are many buildings to see inside the Fort, including mosques, public and private audience halls, palaces, towers, and courtyards. Another attraction is the evening sound and light show that recreates the Fort’s history. Golden Temple, Amritsar: – The number of people who visit the Golden Temple rivals the Taj Mahal. This exquisite sacred Sikh shrine is made out of marble and has a stunning, distinctive gold plated upper and dome. Amritsar, where the temple is located, is the spiritual capital of the Sikhs and gained its name, meaning “Holy Pool of Nectar”, from the body of water around the temple. Humayun’s Tomb, Delhi: – This tomb, built in 1570, was the inspiration for the Taj Mahal in Agra. It houses the body of second Mughal emperor, Humayun. What makes it particularly noteworthy is that it was the first of this type of Mughal architecture to be built in India. The tomb is set among beautiful gardens. Gateway of India, Mumbai: – In reality, more iconic than the Bandra Worli Sea Link, the Gateway of India is Mumbai’s most recognized monument. It was completed in 1924, and was constructed to commemorate the visit of King George V and Queen Mary to the city. British troops departed through the Gateway after the end British rule. Meherangarh Fort, Jodhpur: – One of the top attractions in Jodhpur and the city’s most famous landmark, the impregnable Mehrangarh Fort is one of the largest forts in India. This well-preserved heritage structure rises powerfully above the city and offers panoramic views of Jodhpur’s blue buildings. It houses a museum, restaurant, and many remnants of battle such as antique artillery. Next Guess which 3 Indian landmarks are the most visited!